We love podcasts, so we made a podcatcher that is full featured and simple to use. Features: CROSS PLATFORM SYNCING: Sync your subscriptions, playback and filters between Windows phones, Android and iOS, as well as Pocket Casts Web*. AUTO DOWNLOAD: Customise which podcasts the app will download in the background. No need to even open the app! UP NEXT: Listen to episodes back to back, no fumbling with your phone during your commute. VARIABLE SPEED: Play audio all the way from 0.5x to 2.0x. FILTERS: Want a list of every unplayed episode? Right here. How about sorting your episodes by custom categories? Done. DESIGN: We’ve paid close attention to the Windows Phone design guidelines and where the platform is heading with Windows 10. 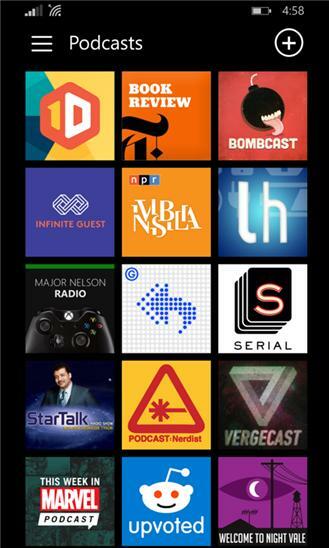 As a result Pocket Casts feels right at home on your phone. CONTROL: Customise the start time of your episodes to skip repetitive intros, and adjust skip intervals to suit your needs. 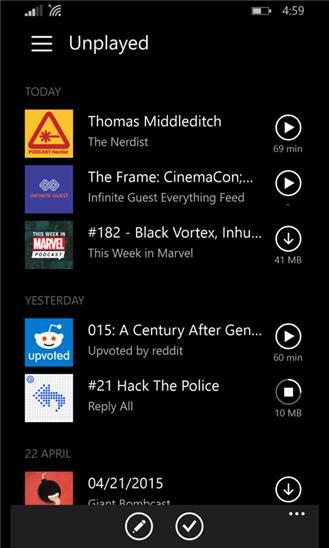 REFRESH: Instantly refresh all your podcasts before other apps even have a chance to do 1! Our servers monitor your podcasts, so your phone doesn't have to. DISCOVER: Choose from over 200,000 podcasts. Find great new content with curated featured, currently trending and most popular podcast lists. SUPPORT: Provided via email, Twitter and Facebook. Heck we occasionally even log in to Reddit to say hello. Pocket Casts also features an in-app User Guide for those that prefer a little hand-holding. * Pocket Casts is sold separately on each platform. Welcome to the first update of many for our Windows app! Those of you who started countdown timers to see how long until we abandoned it are out of luck I'm afraid. It's nothing personal, but I'd avoid buying lottery tickets if I were you ;) Some new things: - You can now long press on an episode in a list to add it to Up Next. - Added an option in podcast settings to refresh artwork, also tweaked the way artwork is loaded. If you had issues with that, they should now be gone. - Called your mum and wished her a happy mothers day. You're welcome. - You can now download episodes even when 'stream by default' is on. Oops. Some fixes: - Fixed some crashes that have been reported. - Fixed font sizes breaking bits of our app. - Fixed your relationship with that person you've been ignoring. Again, you're welcome. - Custom skip times now work via BT and other external controls. - Fixed issues with speeds higher than 1x, reverting to 1x. Next on our todo list is video playback, world peace, and allowing you to pin ALL THE THINGS. We're not sure why, but you peeps are obsessed with pins. We fear for your local butterfly population is all I'm saying. You're on the Shifty Jelly train now kids, there ain't no stopping it or getting off!